If you believe everything that the bookies say then the past fortnight has been a nightmare period for them with huge betting losses incurred for both their racing and football departments. It all started earlier this month when the weekends football action saw 22 out of 23 short favourites obliging across the 4 main English leagues – resulting in numerous stories of multiple accas coming in and some big pay-outs. This was then followed up on Wednesday when infamous racing trainer Barney Curley pulled off a massive betting ‘coup’ with 4 very well backed winners. Yet despite all of this, I don’t feel one iota of pity for them, simply because there is a lot more than meets the eye with these stories. 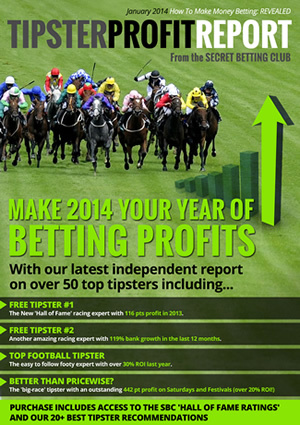 The very latest Smart Betting Club Tipster Profit Report is out now and features the latest results for 54 of the very best betting tipsters we have uncovered in 7 1/2 years of independent reporting. According to the flyer posted through my letterbox by my local David Lloyd Gym this week, research indicates that most people give up on their New Year Resolutions after just 9 days. So if you had vowed to improve your betting in 2014, there is a good chance you might be on the verge of quitting, given that today is the 10th of January. If that includes you then to follow-up my article last week on getting ‘betting fit’ in 2014, I have 5 more essential tips to share on making this your best ever punting year yet! If I am honest, it’s highly unlikely you will go from nothing to making fortunes gambling in the space of a few months. There are people making fantastic sums of money betting (Over 1 in 5 SBC members admit to making over £10,000 betting in 2013 according to a recent survey we ran) Yet they have often built up to that standard over a period of time. Are These The Best Value FA Cup Bets? This Saturday sees the start of the 3rd round of the FA Cup and as always the chance for 1 or 2 surprise results at big odds to tempt punters. So to help you find the best value ‘FA Cup Shocks’ we have run each of the 29 games featuring English League sides through our Fink Tank System. The goal as ever is to use this proven system to identify where the odds might be in your favour! We simply ran the Fink Tank system against the average odds for each game, as taken from the Oddsportal.com website (If you don’t yet know how this system works you can download the free guide via this page). Those bets with the highest percentage value are reckoned by the Fink Tank System to be the ones where the odds lie most in your favour. This isn’t to say they are nailed on to win, but simply means over a long period of time, you will end up on top of the bookie. Rochdale to beat Leeds. At average odds of 3.99, the Fink Tank suggests this offers 17.3% value. Rochdale are currently available as big as 4.20 with Ladbrokes. Southend to beat Millwall. At average odds of 3.06, the Fink Tank suggests this offers 17.5% value. Southend are currently available as big as 3.20 with Totesport. Some other notable value suggestions include the draw between Aston Villa and Sheffield Utd (19.2% value at 4.35) and Everton – QPR (17% at 4.68). All in all, the Fink Tank thinks there are 9 teams at value odds of 15% or higher with the potential for perhaps the biggest shocks featuring Blackburn and Derby. The biggest value of all also lies in the game between cup-holders Wigan and MK Dons, with as much as 82.5% at the suggested average odds. Good luck with all of your bets for the FA Cup this weekend whatever you bet on! Please note – this article uses odds taken from Friday Evening on the 3rd January, so be sure to check http://www.oddsportal.com for the latest odds if having a bet. 3 days into the New Year and if you are anything like me, chances are you have already taken yourself off to the gym to try and burn off some of the extra calories piled on over the Christmas period. And this is where the parallel with betting comes in, because if your New Year’s Resolution involves making more money punting, you can really benefit from an expert betting ‘Personal Trainer’….someone to help improve your betting fitness!